Tuesday’s post about Earth Day got me thinking about environmental education. I wrote recently about Barbara Dyer, Family Trips chair for AMC’s Worcester Chapter. She is also a teacher who has found a way to incorporate her love of the outdoors in her work. She sent me the following ideas for involving children and teenagers in the outdoors. She wrote them with teachers and AMC volunteers in mind, but her ideas aren’t limited to those groups. • Present your ideas to your principal, faculty, and school committee. • Partner with local conservation groups. • Create a class using your skills, passion, and interests in the outdoors. • “Green” is in right now, so look for funding from your AMC chapter, PTO, education foundations, retailers, local conservation organizations, and everywhere! • Integrate the natural world into your curriculum through the use of technology. Create posters, slideshows, brochures, newsletters, video, etc. • Bring students on field trips to environmental programs like Nature’s Classroom, AMC’s A Mountain Classroom, Stone Environmental School, and others. • Help students create an environmental or adventure club to get kids outside. • Join the scouts as a leader. I hope you’ll share your own ideas for introducing more children to the outdoors. • AMC programs: A Mountain Classroom, family and teen programs, Chapter activities. • Nature’s Classroom environmental education programs in New York and New England. • Semester programs for high school juniors at the Mountain School in Vermont. 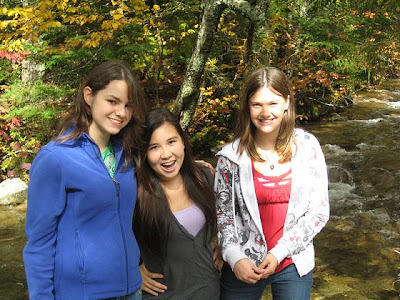 • Residential and day programs at Stone Environmental School in Massachusetts.